Here in Montana the snow keeps falling and falling. Moose and I have decided we LOVE snow like this. We are also glad that we are leaving it all behind and it is not our problem. We have been having so much fun in Montana. 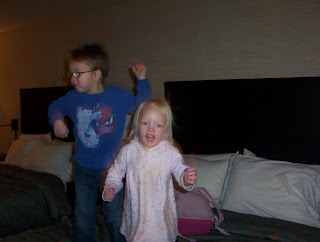 I would like to have been blogging more but we are having trouble uploading pictures. There will indeed be photos of the kids up to their armpits in snow. 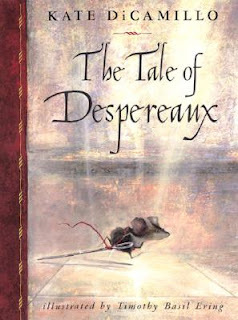 That is how I feel about the movie The Tale of Despereaux. I can't believe Kate DiCamillo allowed such a hack job of her lovely story. I am hoping she at least was paid an obscene amount of money and had no control over what the studio did. The themes of love, revenge, and FORGIVENESS were completely lost. So, please do not see the movie. Read the book , read it again and again. It is an easy book and you can read it aloud to even your little children. They will love it, you will love it. I was supposed to give a talk in Sacrament meeting today, but church has been cancelled because of the snow, again. As you read this we are attempting to drive to Montana. Merry Christmas. Christmas truly is the most wonderful time of the year. It is so wonderful to sings songs, decorate , remember Christ's birth, eat treats, give gifts to loved ones and reunite with our friends and family. In fact as soon as Sacrament meeting is over today our family is driving over the river and through the woods to visit our families in Montana. On my husband's iPod is a playlist of Christmas songs to listen to as we drive as well as a reading of my favorite Christmas book “A Christmas Carol” by Charles Dickens. I wonder, how can we keep Christmas all year long as Scrooge pledges? “True happiness comes only by making others happy—the practical application of the Savior’s doctrine of losing one’s life to gain it. In short, the Christmas spirit is the Christ spirit, that makes our hearts glow in brotherly love and friendship and prompts us to kind deeds of service. We have covenanted to be like Christ, to stand as a witness for him and to do the Lord's work here on Earth. When we serve others we are serving the Lord. To Keep the Spirit of Christmas all year long I propose that we must serve one another all year long. Why should we serve? How can we serve? We serve not only to help the Lord answer the prayers and bless the lives of others but serving changes us. “Service makes us strong in our faith and useful in His kingdom. Service gives us purpose and courage in life. It brings us closer to God and helps us refine our divine nature. It teaches us to love and understand our fellowmen, and it helps us forget about our personal desires, eliminating selfishness, pride, and ingratitude. It teaches us to think of the needs of others, which allows us to develop the virtues that the Savior possesses. Kindness, love, patience, understanding, and unity will increase as we serve, while intolerance, jealousy, envy, greed, and selfishness decrease or disappear. The more we give of ourselves, the more our capacity to serve, understand, and love will grow. Those who serve will always seek to please God and live in harmony with Him. They will be full of peace; they will have a cheerful countenance and a spirit of kindness. Those who serve will always be willing to share what they possess and what they know at all times, in all places, and with all people. What a wonderful, description of the many ways service perfects us. In my home you will find untidy piles of paper everywhere. From time to time I will find tucked here and there in corners and drawers “thank you” notes. These notes are from many people whom I have served in some way. I don't keep them around or mention them to say “Look at all the service I have done.” I keep them because each note reminds me of a time when I looked beyond myself and did something for someone else. With every act of service I have learned a lesson and grown a little bit. It is nice when I am rummaging around for a coupon, or a shopping list, or that plastic part to something I saved 3 years ago and find a little card that reminds me of these lesson I learned. Service takes us out of ourselves for a a time. We take time to think of some one else to remember that they are a child of God as well. When we return to ourselves we are more able to appreciate our blessings, strengths and relationship with the Lord. “When we reach out to bless the lives of others, our lives are blessed as well. Service and sacrifice open the windows of heaven, allowing choice blessings to descend upon us. Surely our beloved Heavenly Father smiles upon those who care for the least of His children. Since hearing those words from President Uchtdorf. I have been trying to seek out opportunities to serve. Now instead of waiting to be asked, I call sister Jones and say “I need to bring a meal to Sister ---. When can I do it?” I teach, I give advice, a hug, a listening ear, moral support, love, food and sometimes handmade gifts. Sometimes I just take time to talk on the phone about whatever. One of the greatest opportunities to serve that I have been blessed with is being a visiting teacher. Time and again I have come to love, really love the sisters I was assigned to serve. I enjoy the responsibility of looking after them and being their friend. We can do service in quiet simple ways. My father reminds me to do every little thing you think of to help someone because it can't hurt and you never know what will make a difference to some one. Sometimes service can be done secretly. One of my fondest memories is of taking a big box of toys, clothes and food and secretly leaving it on the porch on Christmas Eve. I may never know how that event affected the recipients but I know how it changed me. We can also use our talents to serve, singing a song, or mending clothes. Doing something for someone that they can not do. One of the most fulfilling acts of service is teaching someone to do something that you know how to do. When new neighbors moved into a house up the street, I was mindful of the hardships faced by the previous family who had lived there and regretted the missed opportunity to serve them. I yearned to help,.... but I felt inadequate and uncomfortable reaching out to someone I did not know well. Now, with a new family moving in, I determined to become friends. They were warm and loving, and the friendship grew easily. Soon after their arrival, however, a tragedy occurred—the couple’s baby died from Sudden Infant Death Syndrome (SIDS). Remembering my hesitancy to reach out during the previous sister’s time of need, I wondered what to do—anything, even something small. How could I express my heartfelt sorrow to this family? I knew their hearts were broken, and this time I determined not to be afraid to reach out. “I can make rolls,” I thought. “They have to eat sometime, and rolls are easy to make.” I knew that baking rolls would not compensate for the loss of a child, but it was something I could do to show my love and concern. When I went to their home with my humble offering, I realized that my visit offered a small bit of consolation—the rolls were not necessary, but they had given me a reason to visit. I liked this story and chose to share it because I often feel like what I have to offer is not good enough, “What will people think of me if I do this for them? Will they be offended? Will I be intruding? This person wouldn't appreciate all the time I put into this.” I often hesitate to serve because of fear. I am reminded that fear is not of the Lord. If we are afraid , are too shy, or don't know how, if we can't find a place to serve we can always pray for opportunities to serve and for inspiration on how to best serve. We can never predict what the Lord has in store for us, whose prayers he will have us answer, whose life we will bless. It is easy to serve our friends and family, the people we know. Sometimes we need to look outside and serve people we do not know or find it difficult to love. After the lights and tinsel are packed away, when the gifts have been given and used I pray that we can remember the Spirit of Christmas as the Spirit of Christ and find ways to serve our fellow men and in so doing serve the Lord. Perhaps our service will bring sunshine to the gloomy Oregon rains, more joy in the spring, more friendship in the summer and warmth as winter approaches again. Let the gift of service the year round be our gift to the Lord this year. I like to watch Martha on TV. I have noticed that she REALLY likes the parts when they make grown up beverages. She seems . . . extra animated. Even when a guest asks a question about an alcoholic beverage her eyes light up. Methinks Martha likes to hit the sauce from time to time. Well I don't drink, and I don't think you should either so here is a fun and festive non alcoholic drink for you. Take one pomegranate, roll it around on the counter squishing all the little seeds inside. Be careful not to split the skin. If you do split the skin just use that spot for the straw. Cut a hole for a straw, insert it into the pomegranate and enjoy fresh pomegranate juice. The end. How the city of Portland deals with snow is a lot like the 5 stages of grief. First everyone is in denial, where they stay home and convince themselves that the snow will go away soon. Then the anger starts as people realize they hate driving in snow. Then barganing starts when folks start to go places again, slowly and only if it's a short distance to drive. Next comes depression because even if the snow were to all go away, we still have another 4 to 5 months of cold, cloudy, rainy weather. And finally acceptance as we all buckle down and go on about our lives all bundled up. Everyone except ODOT. They apparently are stuck in the denial phase. Every year it seems we have severe enough weather that closes down the roads, and every year ODOT shows that the most they can do is hold press conferences and close the roads. Other cities have snow plows and even hire equipment to help clear things up. Needless to say, with the closure of I-84, we had to find an alternative route to go home for Christmas. That route took us through Seattle. It would have taken us further on to Spokane, but it got dark and late and we decided to hole up in a hotel and wait for more daylight (and hopefully for more snowplows). For the kids who didn't have to drive all that way in the snow and ruts, they are having a great time jumping on the beds and watching cable tv. 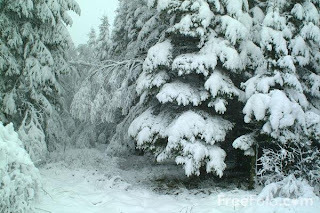 For the rest of us, we only have another day of snow covered mountain passes to look forward to. I miss denial. Each year home is a little different. Each year it seems more desirable to stay in our home for Christmas rather than traveling for 11 hours on potentially treacherous roads to "Go Home." I still look forward to going home but my house after so many years feels like home too. Nevertheless, I'll be home for Christmas. That is assuming we make it through the blizzard. Here's to snow drifts taller than I am, family, old movies, antiquing, cowboys and Anna's Greek Salad. Soon I will be marveling at the top of Lookout pass and saying as I do every year, "It is so pretty here." May the peace of the Lord be with you and your family as we celebrate his birth and his remarkable gift to us. There is about 6 inches of snow in my driveway, or there was before Moose took the leaf blower out. Chains are now required in the Portland Metro Area. Tomorrow we attempt to drive to Montana. Gretel's dress should have been a smaller version of Martha's. The yellow shirt does not go. 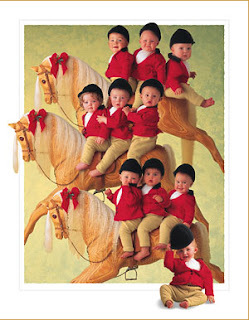 It is more likely that Maria would have used fewer patterns when dressing 7 children out of curtains. Who chose that fabric for Maria's undershirt? It makes sense for the 60's but it would NEVER have been used in 1930's Austria. It looks like a hair shirt. Leisel's dress is so adorable, I think I will make myself one. This is the voice of experience talking, I have made my share of pieces out of old curtains. Maria Von Trapp, Scarlett O'Hara, Samurai Mom. 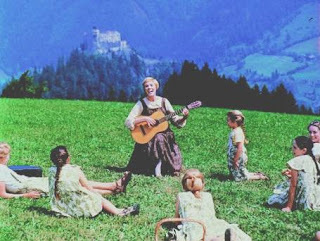 Oh and yeah, kids who have never sang before learn to sing like professionals from the song "Do, Re, Mi." Sounds fishy to me. I love hasbrowns. I really love them. My mom always made them from scratch, so imagine my surprise when I learned the hard way that you don't just grate a potato into a pan and cook (read grey gooey mess). 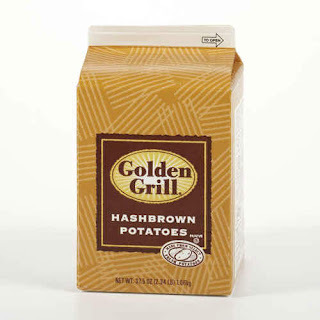 Then I learned about frozen hashbrowns and while I felt very guilty using them (because they are so much more pricey than a plain old potato) they were so easy. Dried hashbrowns. I know it goes against all my food principles. They aren't even organic and everyone knows potatoes are the #2 thing to make sure you buy organic (#1 is strawberries). But they looked so easy and tasted so yummy. So I bought a carton and am making them now. YUM. This is a little song I started singing to Nutmeg last year at bedtime. Moose thinks I should share it with all y'all so here it is. It has absolutely nothing to do with celebrating the birth of our Lord and Savior but I like all of these things. I have no idea what I would do with 12 tatting shuttles. I did a little Holiday un-shopping today. By un-shopping I mean, I went out to the shops and returned things. At the Lego Store I like to think I made some one's day. After I returned a gift that was no longer needed I handed my $5 coupon to a lady in line who had a pile of Indiana Jones Legos in her arms. At Target I returned a towel and Christmas lights for 24.98 or so. Then I picked up leg warmers (because I know I will never make any for myself and it is -15 degrees in Kalispell), a small gift for Commander C's best buddy, a pair of socks on clearance, and the main point of the trip, a pair of Yoga pants for myself so all the guests at Christmas don't have to see me in my jammies that have holes in the crotch. The pants were 19.99. Or so I thought. At the register, my total was 19.44. What? "I asked the clerk really, that's the total?" I accepted it and then looked at the receipt the pants rung up as pants for $4.98. I was sorely tempted to go get 3 more pairs. In the end I left Target with needed necessities and about 5 and a half bucks. Today is my little sister "Weenie's" birthday. I know it isn't a very nice nickname but we gave it to her when we were kids and it stuck. I can't do a very good birthday tribute to her because I don't have very many pictures of her that she was willing to share. Weenie is my best friend (apart from Nutmeg). Isn't it nice to have a built in best friend stuck with you forever? Someone who has to still know you even if you fight with them once in a while or forget to do something for them. Someone you can call when you are out and say - "Will you look up such and such for me because I am lost." We didn't really become friends until after I graduated from high school. I realized she was my best friend after we were both married. To show that I am a good sister I chose to post the picture where I look funny and she looks good rather than the one where she looks like a weenie and I look fabulous. Weenie has 3 adorable children. I love them a lot and they are very, very cute. I would say the cutest , but have you seen MY kids? I love them and tell her all the time that I will take them if she dies or just wants to get rid of them. Her daughter "Little A" looks just like her. Weenie likes to craft and scrapbook. Weenie also likes to spend her husbands money. Weenie has a lot of common sense which is a good thing. Weenie has the smallest ears of the 4 sisters which makes her the winner because we think small ears are a mark of beauty. Weenie is one of my co-partners at MissMossMadness our Etsy site. She makes nursing covers. weenie also has a blog The Best Things in Life Are... which she doesn't update much but she complains enough when I don't. Weenie deliberately deceived me when she was expecting her 3rd. I kept telling her she was pregnant and she continually deceived me because she wanted to keep it a surprise and thought I would tell! Weenie loves to make apple pies and doesn't really love chocolate which is weird. Weenie is not very sentimental or emotional and sometimes I wonder if my parents really did pick her up at the reservation because she is not like me in those ways. We are the best of friends when we are apart but when we get together at reunions or Christmas we always fight because I take things seriously ans she doesn't. GRRR! All in all I love my sister and I wish her a happy birthday and I wish I could see her at Christmas even though I know we would fight. P.S. Weenie, I will post more pictures of you if you send them to me. P.P.S. Moose thought I should post the picture of you when you were pregnant in a bathing suit, but because I love you, I refrained. Mommy Bee asked about people's favorite Christmas films and I thought I would reply here. I love the classics, It's a Wonderful Life, White Christmas (oh, those circle skirts! ), Holiday Inn, Little Women etc, but last month I watched one that reallv stuck with me. 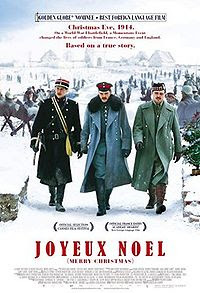 It is called Joyeux Noel and it is a French film about a Christmas cease fire in WWI. It made me think not only about the horrible pointless bloodbath that was the war to end all wars but about the true spirit of Christmas and how people are all the same despite their geographical boundaries. i picked it up on Netflix, I hope you enjoy it. Well Boba Fett is afraid of Obama and Nutmeg is afraid of Santa Claus. That's right, she is terrified that he is going to come through her window. She asks each night in a worried voice if Santa is coming tonight as she clings to me. I was just dancing and singing to the Jackson 5's Santa Claus is Coming to Town and she came up to me and said "Mom our home is not a town, right?" Yesterday we rounded a corner at the Pittock Mansion ans ran into a Santa and I was afraid of an incident but I think she knew he wasn't the real thing, his beard was pretty short, and he was awfully skinny. What should we do? Spill the beans? She isn't quite 3 years old yet, that seems harsh, I never remember believing in Santa and I don't feel deprived of anything? Personally I don't do anything to promote Santa but I don't disillusion anyone anyhow. Besides Santa came in very handy the year Commander C had a problem with stealing and he got a note from Santa and no Bionicle. 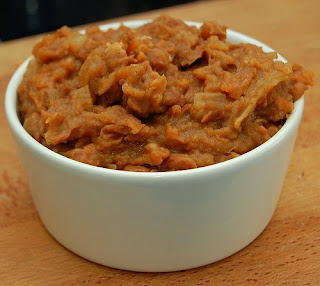 I can make refried beans, but it is stinky and requires forethought. Is it OK to eat the junk from a can and keep all those pinto beans in the food storage knowing that I COULD make refried beans if I wanted to? I have been consumed by gift making and preparations. I have been tangled in a mess of intarsia knitting in the round. It is a mess - not as bad as the picture (which is of my horrid acrylic stash) but close. If you receive a gift from me with intarsia in the round know that I love you very, very much. If you do not,be happy because even though I don't love you that much your gift will look much nicer. I have been very busy crafting for the holidays so I haven't read much lately but here is what I did read. Practically perfect in every way. 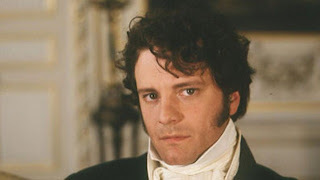 Except I still can't reconcile that it is better to bribe Wickham to marry Lydia and be stuck with him for the rest of her life than a temporary indiscretion of a 16 year old. An interesting book about how fairy tales teach virtue. I am finding it hard to read while knitting, I can't hold the book open. If something happens to me like a fiery plane crash or a snowy mountain automobile accident or alien abduction and you are sent in to clean my house, take care of my family or pack things up, Please know that I have every intention of organizing that cupboard of bowls, pans and dishes as soon as Christmas is over. Please do not judge me on the cleanliness of my home try to remember how fun and creative I was and realize that the messiness is part of the artist temperament. The same goes for my sewing room although I do not have very many intentions of cleaning that up. P.S. If you want to have a go at organizing that cupboard go right ahead and try. Note those little black flakes in everything I think come from the tracks on the drawers and I am sure are toxic so you should make sure you wipe everything out before you use it. P.P.S. And the food storage is under the boy's bunk bed, behind my bed, in the linen closet, behind the fridge in the garage, in the shower in the downstairs bath AND behind the books on the brown bookshelves. On Saturday we we trudged out to our favorite tree farm and cut our tree. We had a tough time finding one that was tall enough but the one we did choose has a fabulous shape. I think it is the best formed tree we have ever had. There are very few empty spaces, and they aren't very big. 10 feet 3 inches this year. We like to have 12- 13 feet. figure that if we are going to have to waste money heating that big vaulted ceiling we might as well get some use out of it. I am in charge of lights. Each year I curse Martha Stewart for teaching me the proper way to light a tree. I takes a LONG time, tons of lights(9 strings this year) and is a pain to take off at the end of the season, but it is so worth it. I love my trees, they are so pretty, the reaction from people when they walk in is priceless. Even if it never gets decorated fully. Moose usually wimps out on me at the end of the decorating. He claims he will do it later. Then eventually I will be expecting company and have to haul the ladder out to the garage and it never makes its way back out. This is just a gratuitous shot of Nutmeg in her new Christmas dress that I did not make, and bonnet that I did make. Things I noticed today on my way to the torture that is shopping for foundation garments. -Girl in the passenger seat of the yellow Mercedes Kompressor pulling her gum out of her mouth in a long string and letting it pop back in. -Someone folding a tank top in the front window of a shop and the tank top was folded so narrowly. There is no way that is 1/4 the width of any woman. -I think that there is a size limit at Victoria's Secret, I have never seen anyone that worked there that was not toothpick thin. I wonder how they explain that to the equal opportunity people. And honestly, it is so humiliating to explain to those girls the requirements of a woman that has borne 3 children. May they have stretch marks, the painful kind. I think that the puppy fever has passed. I don't know what it was but for about 5 days I had a serious case of puppy fever. I know what brought it on. When my dad walked in the door last week he said something about a dog and breeds that don't shed and how it is so good for the kids and before I knew it my firmly held position of no furry pets in the house had gone right out the window in an obsession to find the perfect puppy. For the kids yes, but since I am a clever mom I KNOW that any and all pet duties would fall to me so I had better love that puppy. So I decided I would get a puppy that I liked for me and claim naming rights and take it on solitary walks in the green space. On the second night of the puppy fever I couldn't sleep and got up and read about dogs on the Internet until my computer turned itself off (at 2 am it goes to bed.) 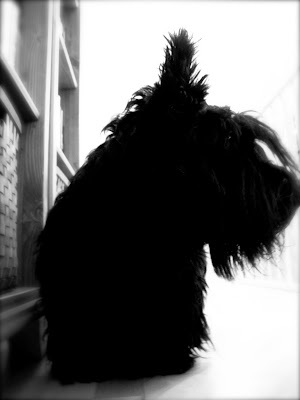 I very quickly settled on a Scottish Terrier because they are so very me don't you think? They like to be the boss and the center of attention, they are friendly and loyal but suspicious of strangers. And they are so very stylish, classic but unusual only a Scottie would go with my fabulous 50's skirts. I also liked that they are small enough not to be in the way but big enough that they aren't ridiculous. Irresistible, non? And then I was hooked I was going to get a Scottie under the Christmas Tree on Christmas day and name him Banquo or MacDuff or some other fabulous name from the Scottish play and we would be pals. After a few days I started realizing that dogs are expensive. Especially Scotties. Apparently Scottish Terrier Puppies are $500 to $700 and even "adopting" a grown Scottie will set you back $450. (Remember the good old days when you could get a dog for free?) Then add all the shots, and vet bills, and doggie beds, and leashes,and toys, and food, and dog dishes. And Scotties are seriously high maintenance what with the haircuts every 7 weeks. Apparently there is A way to groom Scotties and if you deviate you will be arrested by the doggie police and I KNOW there is a large unit here in Portland. So that is I don't even know how much money - every 7 weeks. Or you could learn to do it your self and buy all this dog grooming gear and have one more person in the house to complain when it is hair cut night. Plus a stylish Scottie would certainly need a tartan coat. And did you know that there are Scottie play dates and Halloween parties!?!?! Apparently doggie playdates are fairly common, I don't get it, setting up playdate for kids is weird enough for me. So nearly $1000 in the first year and high maintenance of the dog's coat and the picking up of... well you know what combined with the ultimate realization of the mere possibility of fleas. And that's it, I was done, no puppy. Now, in hindsight, I am glad. I think it was a big step for me, I am not a dog person. When I come to your house and your dog sniffs me, or licks me or jumps on me, I am not even mildly amused. I am trying not to let you see the repulsion. So just the 5 day puppy obsession must mean...something. Right? I am progressing. But Scottie fever has yielded positive things. I now know that Scotties are the most stylish dog, period. Trader Joe's has Scottie shaped licorice candy in the stores right now. The picture at the top of my post is SO cool. Everyone LOVES him. Moose said the words cute and adorable of his own volition. Tomorrow I will make more and have them for sale in my Etsy shop.